The Eppendorf Mastercycler EP Gradient S thermocycler meets your PCR needs with a reliable and flexible solution. This gradient PCR optimizes protocols easily over 12 rows. The Eppendorf Mastercycler EP thermocycler can be used as a stand-alone device, a mini-satellite system or connect and controlled by a PC for a modular laboratory environment. Featuring electronic sample protection, or ESP, this PCR makes certain of consistent and efficient heating of samples. The space saving lid operates with one hand, there is also an optional motorized lid for the fully automated laboratory. ESP technology prevents undesired heating of samples before PCR begins. Evaporation of samples is minimized thanks to automatic tube height adjustments for sample tubes and plates. Descent timing and Ideal closing pressure are calculated independently so samples are protected during the heating process. 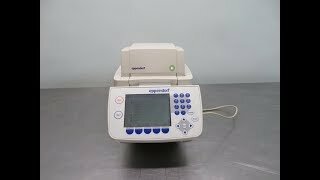 This Eppendorf EP Gradient S PCR Machine comes equipped with LCD Controller and has been tested by our technician to ensure product performance. All of our lab equipment comes backed with our standard warranty. If you have any questions don't hesiate to contact us.